Peas are playing hard to get this spring in San Diego. For the past several weeks, I have been seeking them out, to no avail. Then a couple of weeks ago at the Little Italy Mercato, I spied some. Elated, I dropped the potatoes I was buying, shoved my bags into Jeff's already overburdened arms, with an, "I'm sorry, Babe, but it's fresh peas!" and rushed over to them. I grabbed a bag, eagerly filled it until it bulged, then handed it to the farmer. I was envisioning the bowls of warm minted peas, risotto with peas and pancetta, and farro with peas and artichokes I would soon be eating, when I was interrupted by the farmer. "$16 dollars, please," she said. Assuming I had misheard her, I said, "Six dollars?" "No," she replied, "Six-TEEN dollars," and smiled broadly at me. "They're nine dollars a pound." Nine dollars a pound? Last year, they were $3.99 a pound. No kidding. Look at the sign below. I hesitated. Suddenly my jubilation about eating spring peas was tempered with guilt. Should I really pay sixteen dollars for a bag of peas? I gazed at the cheerful, plump little darlings and rolled the bag over my palms, enjoying the feeling of their marble-like smoothness. That's when I realized, hey, these are already shelled. As if reading my mind, the farmer added, "They're more money, but they're already shelled. It's easier for you." She flashed me another broad, toothy smile. Well, I'll get three or four meals out of them, I thought. I smiled back and handed her a twenty dollar bill. 1. In a large skillet over medium heat, melt butter. Add peas and cook for 1 minute, stirring to coat with butter. Add ginger, orange zest and juice, and salt and black pepper. Cook for 2 to 3 minutes, stirring a few times, until cooked through and just slightly wrinkled. You want them al dente, not mushy. Turn off heat, and stir in fresh dill. Serve atop cooked couscous, quinoa or brown rice with sauteed tofu or shrimp. I LOVE peas and don't understand how some people don't love them. Super sweet and tiny. The winner of The Cutest Vegetable contest surely. I remember watching Top Chef Carla Hall make fresh shelled peas once and every single person on the table oohed and aaahed over her pea dish. Looking forward to trying them with a citrus accent here. Also, not sure if this was intentional, but love how your links at the bottom cascade in perfect order from short to long! I think I'm in the wrong career. I would happily sit and sip tea, watch movies and shell peas... Of course, random checks for quality concern are necessary. 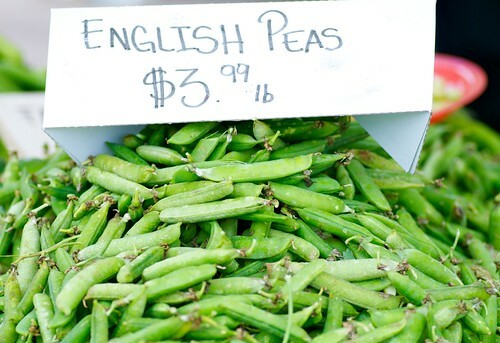 Some things in life are worth the indulgence...and I say that fresh spring peas are definitely one of them! Some girls buy shoes, others swoon over peas. I'm definitely in the latter group, too. And shelled! If I can ever find fresh peas here, I will try this. Oh the price we pay for life's little treasures. I can completely understand the splurge. Some girls spend their money on shoes and trinkets, this girl prefers good food, real food, fresh and perfect. I'm kicking myself for not getting on the ball sooner with my garden and planting peas. Of course, whenever I grow my own peas, none of them end up in the kitchen anyway--I eat them as I pick them! Haha, so funny how you shoved your stuff into Jeff (your husband?) hands and ran for the fresh peas. Hrm, I actually haven't had fresh peas before, i don't believe, but I loveeee peas whenever I've had it. amee-Cutest Veggie, indeed. I understand the love, my friend. sara-I know. That's an inherent liability. ;) And, yes, I do know they cascade perfectly. I'm not Type A for nothin. joanne-We all deserve a little indulgence every now and then. healthymama-Yes, indeed. I do spend a lot of money on fresh produce, but it brings me great happiness. jean-Well, at least you'll be early next year! magic of spice-Yes, it seems many prices are going up. But everyone has to make a living, right? Enjoy!